Effective August 19, 2008 the Federal Emergency Management Agency (FEMA) and National Flood Insurance Program Flood Insurance Rate Maps (FIRM) have been updated and former flood hazard zone designations have been changed. The FIRM panels for North Ridgeville are available through this web site. Follow the steps outlined below to assist you in determining whether your property is located in a flood zone. Using the Master Index Map below establish which FIRM Panel your property shows up on. Click on the FIRM panel number below corresponding to the map panel number. The FIRM panels are large files so it may take a few minutes to load. Each panel has a Legend on the right showing various notations and zone colors. The left side of each panel has notes regarding the data and maps as well as contact information for FEMA. On each panel you can pan and zoom in as needed to see your property and the flood zones with good clarity. 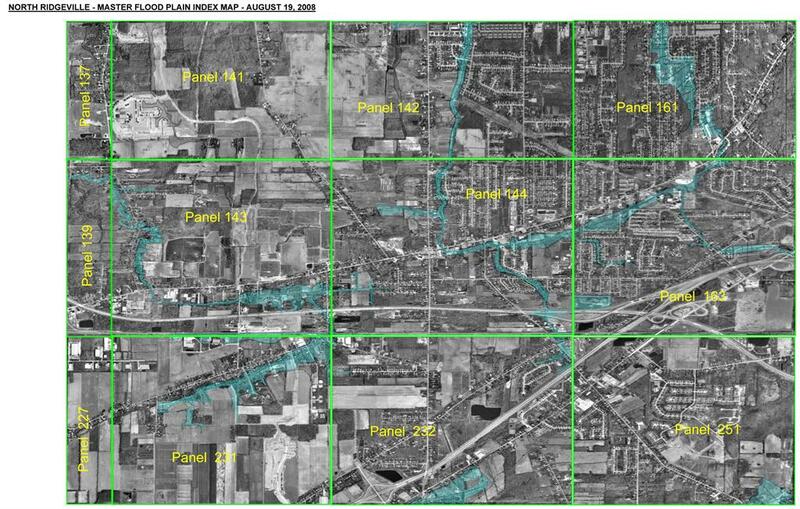 We estimate the aerial photographs are from approximately 2002 and as such many homes in newer sub-divisions may not show up on these maps. If you have concerns regarding your property and cannot find it on these maps you may contact the building department for assistance.